Birthday Parties at the Safety Center: The PVFC is pleased to offer our facilities for Birthday Party rentals for 18 children or fewer, Parties will be scheduled on Saturdays and Sundays at the following times 10:00 am, 2:00 pm or 4:00 pm. We offer two different packages (The Rookie and The Firefighter/EMT) listed below. Each of the packages includes indoor accommodations (the kitchen area) or the outdoor patio space, tables & chairs, and indoor restroom facilities. All party packages are quoted for up to 15 party participants – an additional fee of $20 is added for larger parties to cover our additional supply costs. Unfortunately, we cannot accommodate larger groups, parties or gatherings of another nature, or events other then those involving children. Our facilities can handle only one group at a time on a first come-first served basis. All proceeds go to help fund our Volunteer Fire Company. Thank you for your understanding and your support. 1.The Rookie: (recommended $150 donation) – Includes: Our basic party tour, a Fire crew member/s will take your party around the firehouse to show the ins and outs operations. Children will be able to climb on the stationary fire truck and ask firepersons their questions. 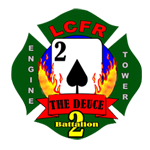 2.The Firefighter/EMT: (recommended $225 donation) – Includes: The Rookie package. Fire-themed party supplies (cups, plates, napkins). Each child in your party will receive a plastic fire hat, coloring book, and crayons. The birthday boy/girl will receive a special PVFD Supporter T-Shirt. Please email cmkermode@purcellvillefire.org for more information and/or to schedule a birthday party.